Winter starts early on the Great Lakes. November in particular is a hazardous month for sailors. At that time, violent lake storms occur due to a collision of warm air moving in from the Gulf with the polar air coming down from Canada. While January has not claimed as many ships as November, that is only because the thick pack ice on the lakes is not conducive to travel during midwinter. One boat, however, was designed to weather the ferocious icy storms of January: the doomed Chicora. The Chicora belonged to the steamship line known as Graham & Morton Transportation, a company proud of its safety record dating back to 1875. Graham & Morton were convinced that with a sturdy enough vessel, the Lake Michigan shipping season could become a year-round enterprise. They also had a wary eye on a competing steamship line that ran both freight and passengers between St. Joseph, Chicago and Milwaukee. With that in mind, the 210-foot long Chicora was designed to not only cut through winter ice, but to give the passenger a deluxe experience. Like the Titanic, she was outfitted with a grand staircase. No expense was spared on the cabins, which were finished with the finest mahogany; staterooms were modeled after the luxurious Pullman car. As the newest and most impressive ship of Graham & Morton, the Chicora boasted 56 state rooms (with sleeping facilities for 200 passengers), a spacious social hall and smoking room, and an oak and mahogany dining room. Illumination was provided by incandescent electric lights, many covered with tinted colored shades. But hauling heavy freight in bad weather had to be taken into consideration as well, thus the Chicora was built with a massive triple expansion engine, two steel Scotch boilers, and a heavy-duty timber frame and thick wooden hull. Capable of speeds exceeding 16 knots, or 7 miles an hour, here indeed was the perfect ship. The Chicora could not only transport passengers to Chicago in style every summer, she was also designed to push her way through the pack ice and ferocious winter storms of Lake Michigan. 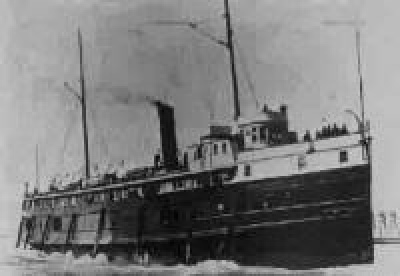 On June 25, 1892 the Chicora was launched by Detroit Drydock Company amid 1000 cheering onlookers at the Orleans street yard. Although she became an asset to Graham & Morton, they soon learned that it would be too expensive to use the Chicora over the winter. More than 5000 ships lie at the bottom of Lake Michigan – many of them lost in winter. Although Graham & Morton sometimes were able to run year round, insurance costs were usually too high to keep the Chicora shipping cargo past November. Instead, the Chicora transported passengers in summer, and hauled freight during the fall and early winter. In season, she ran daily between Benton Harbor and Chicago, (a trip she could make in three hours and 40 minutes), while most of her freight runs were between Benton Harbor and Milwaukee. January 1894 found the Chicora in dry dock. She had been brought to St. Joseph and prepped for the winter; carpets, piano and most of her furniture had already been brought ashore for storage. Her windows were covered, and parts of the hull exterior sheathed in iron for protection from the ice. But although the Chicora was already “ironed for winter service”, an unexpected request for her services came in. The upper Midwest had experienced a late wheat harvest in 1895 due to a colder, wetter growing season. Because of this, flour mills continued to run. Milwaukee warehouses were being filled daily with sacks and barrels of flour. Mills in Kalamazoo and Battle Creek needed winter flour, as did bakeries in Detroit, and shippers in Wisconsin put out the call for a ship to transport a cargo of flour across Lake Michigan to Benton Harbor. The demand was deemed great enough to press the Chicora into service, regardless of the time of year. After all, this was a vessel that was built to withstand midwinter maritime conditions; however it would have to be sent out uninsured. While the Chicora was getting ready to go out on the lake again, her captain scrambled to put together a crew on short notice. A veteran of 20 years plying the waters of the Great Lakes, Captain Edward Stines was forced to replace several members of his crew, who had returned home for the winter. He was even without a Second Mate, who was down with an illness. To make up the manpower shortage, Stines included his 23-year old son Benjamin as a crewmember, making him his new Second Mate. 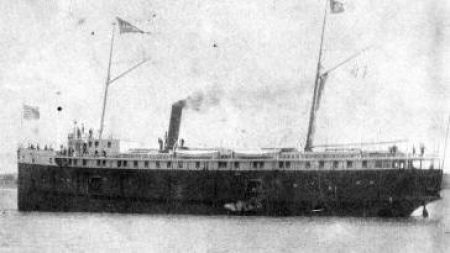 On January 20, 1894 the Chicora departed for Milwaukee carrying a load of dry goods, patent medicine bitters, and six passengers. 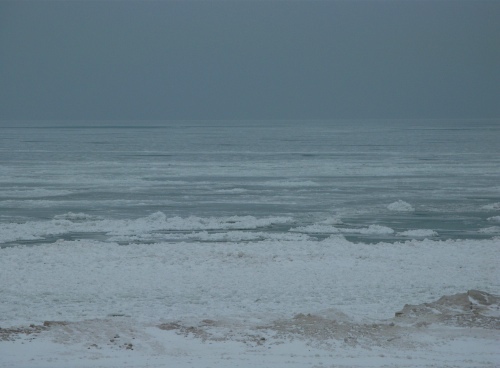 Although ice was building up along the Lake Michigan coast, weather was uncharacteristically mild and the six-hour trip occurred without incident. However just before docking in the Milwaukee harbor, an ominous event reportedly took place. A wild duck flew in the direction of the Chicora, which caused amazement among the crew. Ducks did not normally fly toward a steamship. But before they could get over this uncommon sight, a passenger on board took out his rifle and shot it. The sailors viewed this as a bad omen, comparable to the maritime superstition that misfortune follows anyone who kills a seagull. The Chicora docked at 5pm, and immediately 632 tons of flour were brought on board in 100-pound cloth sacks and barrels. Departure was scheduled for the following morning. Some accounts claim that Captain Stines was not feeling well and thus had added incentive to return to Michigan as quickly as possible in order to see his doctor. Perhaps that was the reason that Captain Stines appeared so sad that evening, going so far as to confide in a Milwaukee stockholder that he regretted not resigning his commission the previous fall. Or maybe he had a presentiment of what was to come. Whatever the reason, he is on record as saying that he wished he had not taken the Chicora out on this voyage. The Chicora left Milwaukee at 5:15am on Monday, January 21. Twenty-three crewmembers and one passenger were on board. The dawn weather was unseasonably pleasant: 50 degrees with light rain. There seemed no reason for concern about the six-hour return trip. And while the vessel seemed to be struggling beneath the weight of its tons of cargo, the ship was designed to carry even heavier loads. The outlook was considerably different across the lake. John Graham, owner of the Chicora, was waiting in Benton Harbor and becoming increasingly concerned by barometric readings. When the barometer continued to fall, Graham wired Captain Stines with instructions to not leave Milwaukee. Unfortunately, when the telegraph messenger arrived at the dock, the ship had already set sail ten minutes earlier. When the ship left Milwaukee, the southeast wind speed was 26 miles an hour. But by the time the Chicora reached the middle of the lake, the wind had shifted and the January storm hit with full force. Buffeted by sixty-four mile an hour winds from the SW, ice began forming from the rapidly dropping temperature. Battered by the sudden onslaught of blinding snow and ice, Chicora fought the storm all afternoon…and lost. When the Chicora didn’t arrive in Benton Harbor later that day, it was assumed that the storm had delayed her arrival. By nightfall however, alarm had set in. Even so, owner John Graham assumed that the ship had been stopped by the growing ice field, and that she would be back in port the following morning. A company agent assured the public that “I do not despair of the safety of the Chicora. It is a good strong boat and ought to easily weather a storm like yesterday’s. 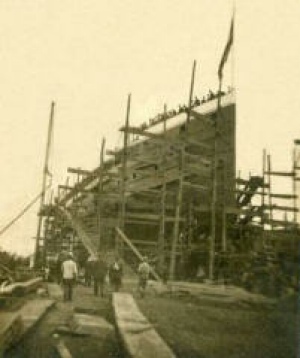 It was built especially for the winter transportation business.” Like the unsinkable Titanic, it seemed impossible that such a ship could be lost to the lake. The following day, telegraphs were sent along the coast of Michigan, asking harbormasters to look out for the Chicora. 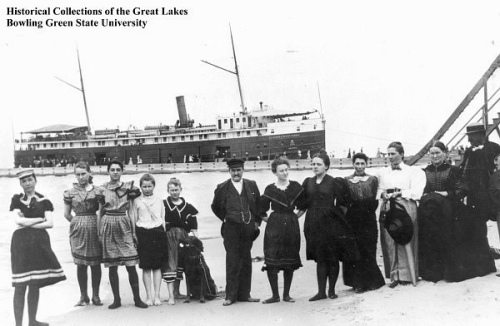 Word spread that several eyewitness accounts had described a ship in distress near South Haven; her stern was visibly sinking and the vessel’s warning horn sounded continuously. As soon as the weather allowed, rescue ships were sent out. The most poignant was the steamer ‘City of Ludington’ commanded by Henry Stines, brother of Captain Edward Stines. After two days of combing the waters for a trace of ship or crew, Henry Stines had to accept the tragic fact that he had lost both his brother and his nephew. Wreckage soon began turning up off South Haven, prompting four hundred people to search the frozen lake despite temperatures of fifteen below zero. Some of the items retrieved were doors, cabin curtains, 12 foot long upper bulwarks, mahogany casings and flour packed in barrels. Men from the communities of Saugatuck and Douglas conducted their own search, venturing out onto the ice as far as they dared. 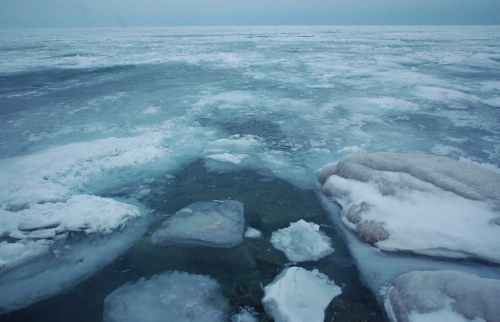 A frozen line of wreckage was discovered – stretching from Saugatuck to South Haven – approx. ¾ mile from shore. Saugatuck resident Christopher Schultz, his sons and the ‘Wark boys’ from Douglas retrieved what was later confirmed to be the Chicora’s two masts and several oars. Empty flour sacks and bulwarks bearing the ship’s name were also found. These masts were given to the village of Douglas, and installed that March as the village’s new official flagpole. The pole served as the village flagpole until the 1930s when its rotting condition led to the mast’s removal. Today the Chicora mast can be viewed at the Allegan County Museum. The same week, yet another message washed up. A note, sealed in a bottle, read: “Our machinery disabled. We could see land if it were not for the snow. Captain and Clarke have been swept over board. We will all be lost; 10:30 o’clock. Good bye. J.D. sic] McClure.” Although jokesters were often known to throw fake messages in bottles into the lake, Chicora engineer McClure had frequently told his family that he would indeed send a message in a bottle should he find himself in a disastrous situation. And the fact that the bottle cork was stuffed with cotton waste – the same type that is used in a steamer’s engine room – increases the likelihood that the message was authentic. 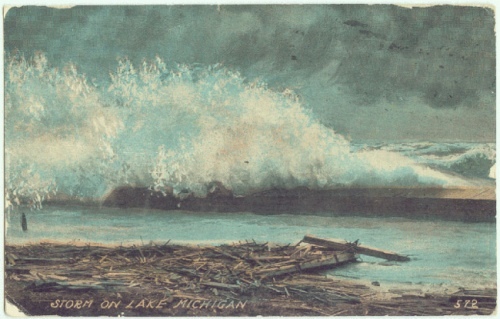 Although built to withstand the ferocity of winter on the Great Lakes, even the formidable Chicora could not survive one of the worst recorded storms to ever hit Lake Michigan. For over a century, historians, treasure hunters, and divers have tried to discover where the hull of the Chicora lies. In 2002, the Michigan Shipwreck Research Associates (MSRA) investigated a wreck resting on the bottom of Lake Michigan that was believed to be the Chicora. The remains of this wooden hull steamer lay just 275 feet from the shore of Saugatuck. However video from later dives showed that the shipwreck’s boilers and hatches did not match the Chicora’s deck plans. Additional dives led researchers to conclude that the wreck was instead the remains of the lost ship H.C. Akeley. But by utilizing the newest methods of computer simulation to ascertain how objects drift in water - and with a little luck - maritime historians, divers and underwater archaeologists still hope to come upon the legendary Chicora...still resting silently at the bottom of the lake. Ghost Ship by Allan Holden, 2003. Chicora: Lost on Lake Michigan (Saugatuck maritime series) : Book 3 by Kit Lane. Pavilion Press 1996. Chicora: Michigan Shipwreck Research Associates, 2003-2008. A Glimpse into the Past: the Discovery of the H.C. Akeley by Valerie Olson van Heest, The Joint Archives Quarterly, Summer 2003. 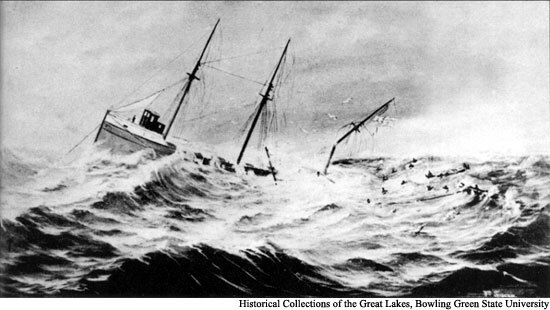 Great Lakes Shipwrecks & Survivals by William Ratigan. William B. Eerdmans 1960. Divers visit Historic “Chicora” Shipwreck by Craig Rich, 2003. Traveling Michigan's Sunset Coast: Exploring Michigan's West Coast Beach Towns - From New Buffalo to Mackinaw City by Julie Albrecht Royce, Dog Ear Publishing, 2007.